Most organisms can tell the difference between night and day simply by taking a look outside. But some may rely on more subtle clues. A few years ago, scientists discovered that corn plants release a different set of chemicals into the air in the morning and evening. 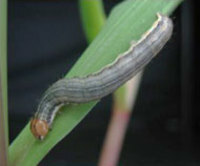 Might the M. separate caterpillars, which live on corn plants throughout Asia, use these odors to plan their schedules? A group of researchers at Kyoto University in Japan decided to test the theory by collecting gas from the plants during the day and at night. They then exposed one set of caterpillar larvae to the daytime fumes and another set to the evening fumes and observed the larvae for several hours. The creatures were almost 50% more likely to go into hiding--which they typically do during the daytime--after being exposed to the "day" fumes than they were when exposed to the "night" fumes. Night fumes made the caterpillars come out of hiding to feed on leaves, their typical evening activity. Surprisingly, changing the lighting conditions had no effect on the caterpillar behavior, indicating that the insects use plant scent alone as an alarm clock, says study co-author Junji Takabayashi.